A couple tips on coating with a "puddle pusher"
The ink helps you see how good your technique is and how much sensitizer will cover a given area well. On the left you can see a dropper in a cup for measuring out the exact amount I would use to coat with real sensitizer. 1. I love Bostick and Sullivan, but the prices for their glass coating rods are high. Find a glass blowing shop or supply store and they will see you about four feet of rod in almost any size you want, cut to lengths you like, for about five bucks. 2. Practice coating some cheap paper or toss offs using water mixed with food coloring or ink. I used the india ink I set to make glop for carbon printing. The tint will help you see how complete and smooth your coverage will be. This will give you good practice before you start coating with the expensive metals and paper. This May I will be teaching an alternative process intro class through UT Informal classes. The class will be comprised of four three hours sessions and cover the basics of preparing images, making negatives for contact printing, making some salt and cyanotype prints, and more. For more details check out the official class listing for Explore Alternative Photographic Printing. If you have questions about the course, just shoot me an email. Want to party like it's 1869? I'm currently designing an introductory course to alternative process printing and film photography I plan to offer in Austin Texas in the fall of 2013. The course is designed for students who want to learn the fundamentals of taking an image from a film negative all the way through to a full size hand made print. Course materials include your own piece of fantastic plastic. Accordingly, the course will focus as much on foundational skills applicable to all alt process printing as it will the specific processes we employ in making our prints. To build confidence, emphasize basic skills, and have fun, we will take and develop pinhole images on medium format film, scan and create full size digital negatives from the film negatives, and create a cyanotype or vandyke print. Included in the course materials will be a Holga pinhole camera. However, students will be encouraged to shoot and develop film from their own small and medium format cameras. I'll be available to teach students to use cameras they are unfamiliar with or advise students in purchasing a film camera suited to their needs and budget. Students can also use digital images. The course will be held in three weekly sessions and will be limited to six students. The course tuition will be approximately 250.00 and will include all materials. The course materials and schedule are still under development. So, contact me directly if you are interested in enrolling. This August I was fortunate to attend a five day photogravure workshop with Paul Taylor at Renaissance Press. I've been planning to attend for over a year, and it was worth the wait. Like carbon transfer, photogravure is difficult. There are nuances of the process and the materials that would have been fiendishly hard to learn on my own. Paul inspecting positives with different contrast curves before exposing a photopolymer proof plate. Well known as an atelier for his work in gravure, Paul was also an exceptional teacher. Over the course of five days I learned enough to carry on in gravure on my own. However, I was also happy that we when through the entire linerization process for producing high quality film positives for gravure. What I added to my knowledge of digital film was almost a workshop of material in itself. The days were long, but we were also able to take a crack at photopolymer gravure as well. All in all, I was able to produce two copper and one photopolymer plate and spend most of one day printing all three on the press. The printing time was enough to make inking and wiping the plates feel familiar and allowed Paul to show us a few special techniques like retrosage, dodging with hand and chalk, and stipling defects on the plate. 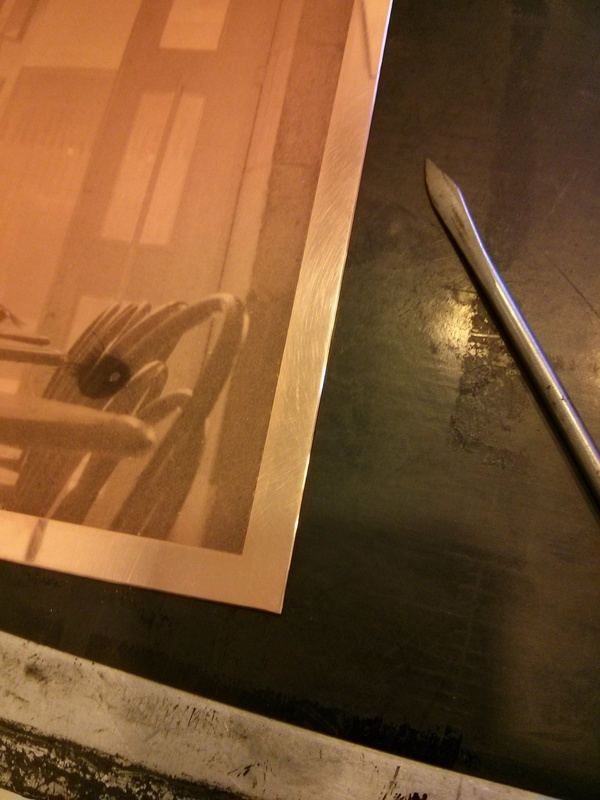 Two copper gravures ready to be inked. Stippling a defect in a plate. Photoshop 19th century style. Beyond learning a specific process, I've found that attending a workshop is equally valuable for the exposure to exceptional prints, presentation, and working methods. As printers in high end niche processes, it's a rare and valuable opportunity to see exceptional work. Experiencing masterful work is inspiring and also offers a benchmark for where you are in your own craft. This was true for me when I took my first workshop from Sandy King and equally so at Renaissance Press. I highly recommend Paul's workshops. His studio is in a beautiful, but very rural part of New Hampshire. I biked the entire trip having flown into manchester from Austin. However, if you are going to bike it, expect some long rides and steep hills. Otherwise, look at renting car and having a relaxing stay in Keene or Brattleboro.